For best result, consume product within a month after opening. Excellent for everyone to take on a daily basis. Great for mid-aged women in their menopause. Releases extravasated blood, regenerates skeletal structures, and pastes bones back together. Comes with dietary Uses and lowering of cholesterol levels. Safflower powder can be mixed with smoothies, meal replacement shakes or drinks. 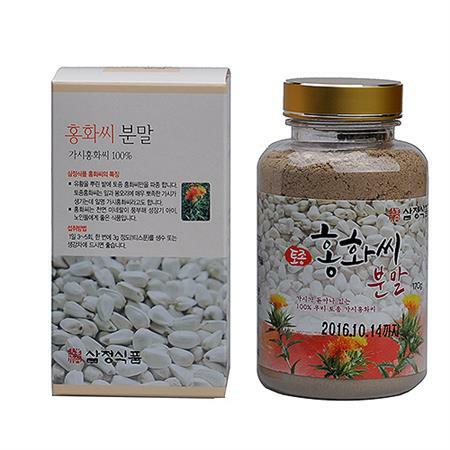 Safflower seeds-Korean Traditional method-Roast handful of Safflower seeds in pan without oil until browned add to four quarts of water bring to boil to make golden safflower tea. Enjoy warm tea throughout the day. *Shelf storage expires 6 months from manufactured date stamped on the package, otherwise expire date is stamped. *Once opened, store in refrigerator or freezer and consume within 1 month for best results. Suggested Serving: Take one to three spoonful a day by itself or mixed with fluid( works best with water (9x salt may be added for taste), milk, soymilk, or green smoothies). Be cautious of suffocation due to direct powder intake.